Secrets and tricks to making PERFECT creamy, flavorful mashed potatoes every single time. 1 head of garlic cloves individually smashed with the back of a knife. Melt 1 stick of butter on a low heat in a small saucepan. Continue to keep warm on a low heat until milk solids rise to the top, remove. Add smashed garlic and cook on low to infuse the garlic, 15 minutes. Remove garlic and keep warm. While the butter melts and garlic cooks, add potatoes to a medium pot and fill with water making sure all potatoes are covered, Season liberally with salt. Bring to a boil and reduce to a simmer until potatoes are fork-tender, about 15-20 minutes. Drain potatoes, making sure to get rid of ALL excess moisture. VERY IMPORTANT! While potatoes are still hot, pass through a ricer and add back to pot. Pour in melted butter, salt, warm heavy cream and sour cream (sour cream does not need to be at room temperature) and salt. 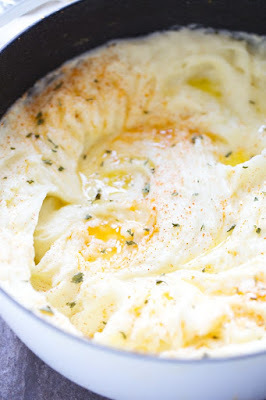 Using a hand held mixer, beat the potatoes on high until all ingredients are incorporated and potatoes are smooth and fluffy, DO NOT OVER BEAT. Season with salt and pepper. Transfer to serving dish. Melt remaining butter and pour over potatoes. Sprinkle with paprika and chopped parsley. 0 Response to "HOW TO MAKE THE CREAMIEST DREAMIEST MASHED POTATOES"